Sandwiches don’t have to be basic or an afterthought. Step it up a notch with high-quality flavors. No more white bread and sad, discounted lunch meat. Try some of that leftover steak between two slices of artisan sourdough. 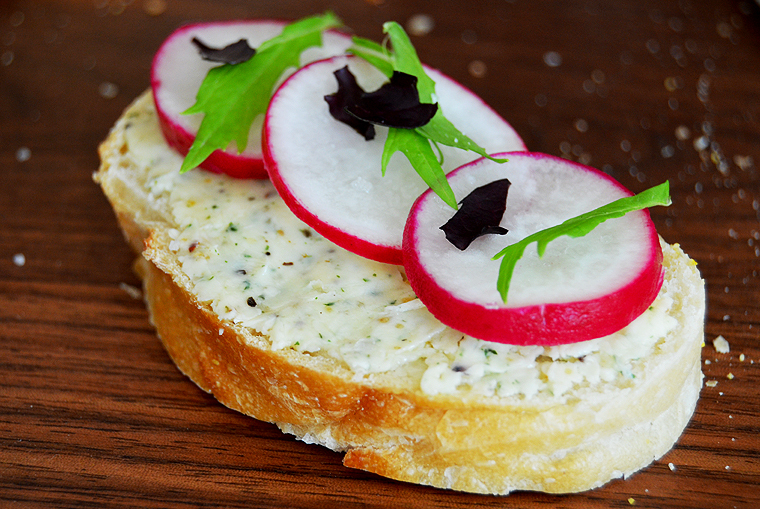 Consider in-season produce for a colorful meal - like A Cook’s Canvas' creation of Radishes with Butter and Sea Salt on a Baguette. It may be clever for that new burger joint to create monster burgers you can’t fit your lips around, but we feel it’s more dignified for a sandwich to be eaten easily and that all of its ingredients can be enjoyed without competing for attention. We’re not alone in this. There’s a $26 sandwich in Washington DC that has only three main ingredients - and it’s the second most popular dish on the menu. With only a few ingredients, every single one has to count, and your condiment is no exception. You could go for mayo, but butter is a good choice, too. Butter softens the bread. Butter provides a rich flavor. Butter is an ideal moisture barrier. If you have to make and pack a sandwich, butter can keep the bread from getting soggy from sandwich ingredients like tomatoes and damp lunch meats. Save the unsalted butter for baking. Save the unflavored butter for…well, nothing. Choose a compound butter flavor to complement your other sandwich ingredients. Having said that, we like toasted sandwiches, too, including this Caprese Sandwich. Hope you enjoy the recipe! - Set oven to 400 degrees F. Slice bread and place on sheet pan. Once heated, lightly toast for 5-6 minutes. - Meanwhile, wash all produce and slice Tomatoes and Mozzarella. - Remove bread from the oven and liberally butter all 12 pieces while the bread is warm. Add Salt and Pepper to taste. - Assemble sandwiches and serve immediately. Optional: Add a small grilled chicken breast or baked ham to make it a meal. Consider super-stacking your Caprese sandwich by adding one additional piece of Mozzarella, Basil, Tomato, and Bread. Instead of toasting in the oven, you could choose to warm the bread on a grill.